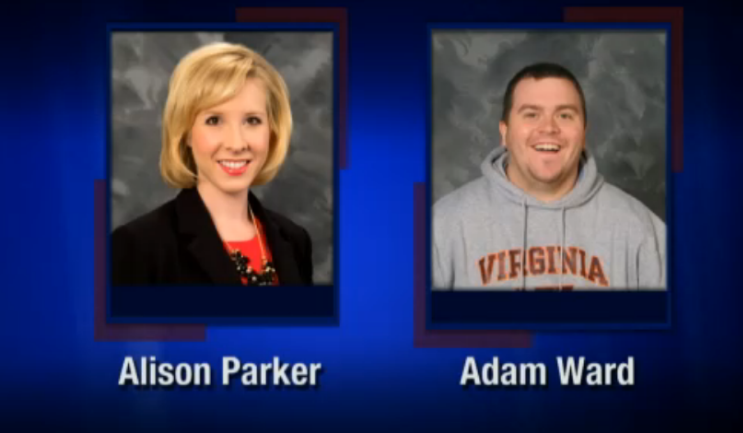 Shooting victims Alison Parker, 24 and Adam Ward, 27 worked for WDBJ, the CBS station based out of Roanoke, Virginia. Courtesy of WDBJ. On Wednesday, August 26, 2015, gunman Vester Flanagan shot journalist Alison Parker and cameraman Adam Ward on live television. The shooter who went by the name of Bryce Williams on air was also a reporter for WBDJ-TV in Roanoke, Virginia. At about 6:45 a.m., the live footage shows Parker interviewing Vicki Gardner, executive direction of the Smith Mountain Lake Regional Chamber of Commerce, in Overton when Williams opens fire. Screams can be heard in the background and the end of the footage shows a brief image of Williams pointing a gun at the camera before the scene pans out to show a shocked news anchor in the studio. Virginia State Police tracked down the suspect and attempted to pull him over, but the driver refused to stop until he crashed into an embankment 170 miles away from the site where authorities found him dead from a self-inflicted bullet. Two hours after the shooting, a 23-page fax arrived to ABC News detailing his claims of struggling through racial discrimination and sexual harassment. He described his admiration towards the shooters at Columbine and Virginia Tech and said that the Charleston, South Carolina shooting also further enraged him, prompting him to put a deposit down for a gun two days afterward. Williams appeared to also have taken footage of the scene, reporting from his own Twitter account. In a series of tweets, he reveals, “I filmed the shooting see Facebook.” He also claimed that Alison “made racist comments” and “Adam went to hr on me after working with me one time!! !” on Twitter, which has not been proven to be true or not. Williams was hired in 2012 but was released from the job the following year due to performance issues. He displayed anger and behavioral issues during his time with WBDJ and was advised to seek counseling. He also filed a lawsuit against the station and was said to have created a disturbance and needed to be escorted out by police the day of his firing. Parker, 24, was hired a year prior and had been a summer intern news reporter for WDBJ in 2012. She was a morning reporter for the Roanoke station and was going to marry fellow reporter Chris Hurst. Ward, 27, joined WDBJ in 2011 and was engaged to morning show producer Melissa Ott. He had a degree in communication and media studies from Virginia Tech.